Kara is passionate about encouraging people to live fully and joyfully in their season of life. 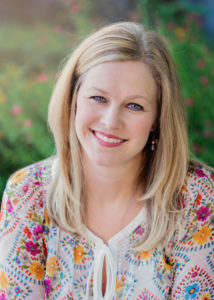 She and her family live in Texas where she stays busy being a leader in children’s and women’s ministries at her church and volunteering with her kids’ schools and activities. She helps with marketing and patient recruitment at a study center and works alongside her husband in real estate. She has developed devotional materials, bible studies and messages and loves to communicate with audiences at retreats and luncheons. She has also been blessed to speak internationally during some of her mission trips to Cuba and Asia. She is a wife to her sweet husband Phillip Gunn, (who also happens to be Robin’s little brother) and an imperfect mom to three fun loving kids – Sara, Seth and Noah. She doesn’t currently have much free time but when she does, she enjoys watching movies with her family and going for coffee with friends. Kara strives to overcome obstacles in her life and encourages others to do the same. 1. Be in community for mutual support!